Incorporating her professional background in legal and human resources, Sheila leads two workshops to help those who are starting a career, in mid-career or going through an unwanted job change. A workshop for those planning their next steps in their career. Are you looking for a biblical approach to career planning?… Or a workshop thathelps students identify their personal career vision and mission? This forward-looking workshop is a working session where students discover who God made them to be and helps them apply that to their future career. Using Biblical principles, each participant will analyze their strengths, personal characteristics, passions, and talents to discover who they are and the career direction they should go. The Work-Life Adventures workshop will enable and encourage participants to tackle their new or changing work-life worlds with confidence, hope, and excitement! whether they face job loss, unwanted job change, or mid-life employment blues. Is an area business laying off a number of employees? Are you seeking an outreach option for the soon-to-be unemployed? Do you want to energize individualsin their careers, enabling them to discover their God-given potential? Sheila guides participants toward discovering their true identity and applying it to their work life through self-examination exercises and Biblical principles. Sheila’s workshops can be offered at any time. Personal consultations are available. Contact Sheila today! Facing job loss can be a painful experience. Yet, it creates a unique opportunity to evaluate your past, question your present and dream of your future. 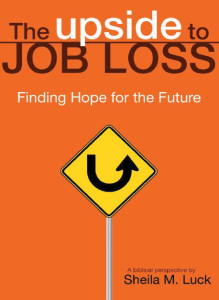 The Upside to Job Loss helps the reader identify and define their God-given career and life story. It sets parameters for a strong, focused job search with clear employment direction for greater personal satisfaction and fulfillment. ©Copyright Sheila Luck. All Rights Reserved.